Tim Hortons has arrived at the St. James Business Centre, Linwood, with the opening of the latest café & bake shop Drive Thru. G D Lodge Architects were engaged by Squarestone HUB to deliver the shell building and the fitout team have now completed the unit. Check it out next time you are passing…delicious! Work is nearing completion on the internal refurbishment at 206 St. Vincent St. Glasgow. The interiors are stunning and genuinely transformational, giving this handsome listed building a new lease of life. 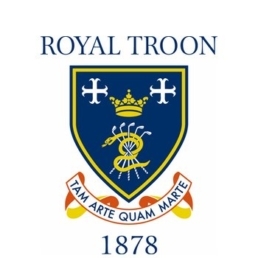 We are delighted to be working with Royal Troon Golf Club on their practice area improvements. Construction work is now well underway on the new driving range and practice bay facilities. 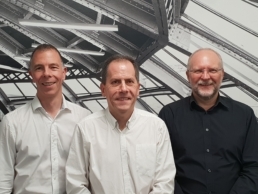 We are delighted to announce that our Associates- Alec Milne & Colin Anderson- are now partners with the practice, joining Bruce Baird at the helm of the management team. 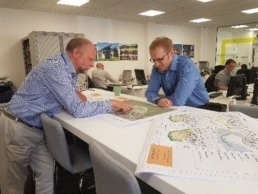 Alec & Colin are outstanding architects and have been responsible for numerous award-winning projects. The practice is in safe hands and we look forward to this new chapter with some exciting high-profile projects to kick start out new financial year. At the same time, long-standing partners, Robert Hirst & Ken Storrier have chosen to step aside from partnership to become consultants. Both have given their entire career to the practice and leave an incredible legacy. We thank them for everything they have achieved and look forward to their ongoing commitment & support. 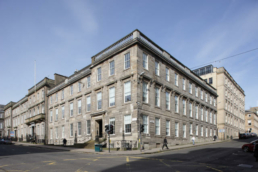 Work has just started on the comprehensive refurbishment of 206 St. Vincent Street- a handsome 6 storey Category B Listed Building in Glasgow City Centre. 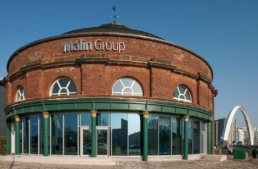 The work will create high quality Grade A open plan office space including transformation of foyer, reception, common areas, lightwell & feature roof terrace. 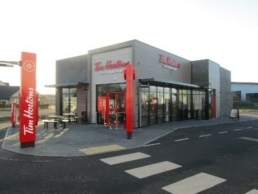 We have just finished the shell build for the latest Tim Hortons Drive Thru unit at The St. James Business Centre. The fit out team will now take over with completion scheduled to catch the Christmas trade. Construction work is now well underway on this exclusive development for award winning developers Panacea Property. The scheme comprises 12 luxury bespoke two and three bedroom apartments, located in the highly sought after sea side town of Helensburgh. The original building dates back to 1837 and was designed by the celebrated Scottish architect William Leiper. Leiper was responsible for many striking designs, his most famous being the Templeton’s Carpet Factory on Glasgow Green. His works are part of the Arts and Crafts Movement and the Gothic Revival style. “The Primary” is another luxury residential development by award winning developers Panacea Property. This development comprises the imaginative conversion of the former St. Agatha’s primary school in Kirkintilloch, to create bespoke 3 & 4 bedroom properties, together with some stunning contemporary new build homes in the former grounds. Construction work has now started on Phase 2 of the Quarry Road Development in Irvine. We are delighted to be working with Ashleigh Construction on this project, which is being delivered through Hub SW. Top class sports facilities will include a full size external all-weather floodlit pitch for football, a half size indoor pitch for coaching and training football, together with 3 all-weather floodlit tennis courts, a 750m cycle loop, all serviced by purpose built changing facilities. 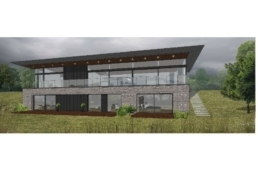 Work will soon begin on this stunning new home on the Isle of Arran. “Blairbeg” commands a superb position, on a south facing hillside with magnificent sea views. 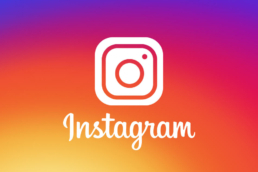 This is one of several fabulous projects we are designing for John Thomson Construction Ltd.
G D Lodge Architects are now on Instagram, follow us to keep up to date with our latest projects. 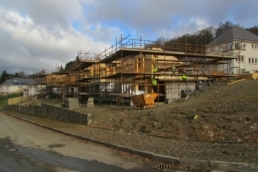 Construction work is now well underway on the next four villas at Kingspoint, Shandon. 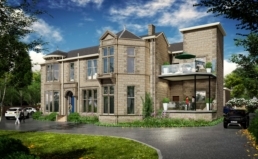 This luxury residential development, by Kingspoint Properties, occupies an elevated hillside location at Shandon, near Helensburgh. All the new homes have magnificent sea views. Only 2 plots remaining in this phase! An exclusive development by award winning developers Panacea Property, comprising 12 luxury bespoke two and three bedroom apartments, located in the highly sought after sea side town of Helensburgh. 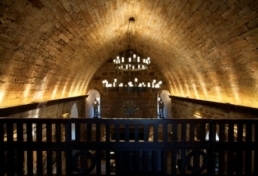 The original building dates back to 1837 and was designed by the celebrated Scottish architect William Leiper. Leiper was responsible for many striking designs, his most famous being the Templeton’s Carpet Factory on Glasgow Green. His works are part of the Arts and Crafts Movement and the Gothic Revival style. Construction work is now well underway at Maidenhill: a Strategic Greenfield Release site at Newton Mearns. G D Lodge Architects masterplanned the development and helped secure Full Planning Permission. The project will deliver over 800 residential homes with fully integrated affordable housing and a new community primary school. The development is a joint venture between CALA and Taylor Wimpey in Partnership with East Renfrewshire Council. Congratulations to Design Direction for winning “Best Hotel Interior Central Scotland” at The International Hotel & Property Awards 2017. It has been a pleasure collaborating with you on the stunning work at Borthwick Castle and we look forward to the next ambitious phase of work. We are pleased to announce that G D Lodge Architects have achieved Quality Assurance Certification in accordance with ISO 9001:2015. The process has enabled us to streamline our procedures to ensure the highest quality of service to our clients.